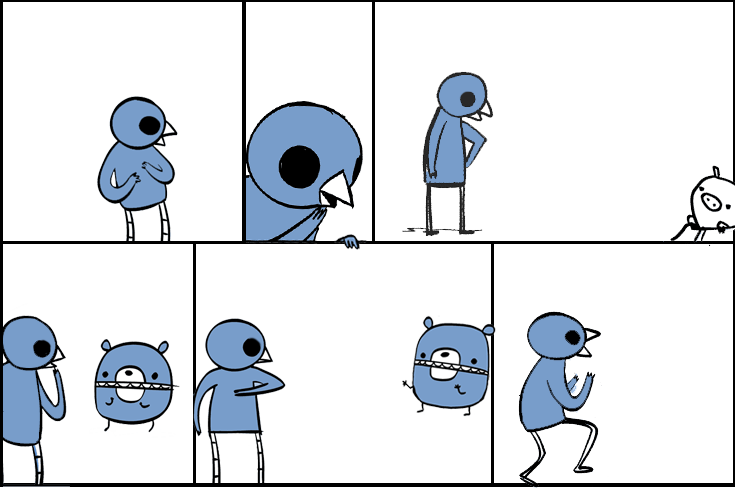 Dinosaur Comics - January 9th, 2008 - awesome fun times! –Or maybe he's travelled to the Universe of the Lesbians! January 9th, 2008: I am lucky enough to have this power, which I will call the Power of Internet Popularity, a power shared by a few other people. With this power I can sometimes just make stuff up, and then this stuff becomes real. It's crazy! But it's also fantastic. Peter Parker tells me to use this power wisely and to that I say, "Sure thing, Mr. Parker!" Last week I talked about mashing up "Smells like Teen Spirit" and "Layla", and both David and Eddie made my fevered dream a fevered reality. These songs are great, and insane. They sound like a crazy person composed them, but as you listen to them, the craziness starts to make sense. Eddie Davis - "Smells Like Layla"
David Cummings - "Smells Like Layla’s Spirit"
Enjoy! And thank you so much, Eddie and David! One year ago today: if there's ever a zombie epidemic, i pledge to be the first - the first! - to blame the sucky zombies.